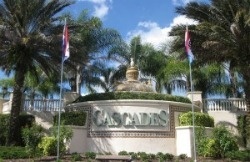 The Cascades of Sarasota offers a resort-style lifestyle for residents 55 years and older. this neighborhood is perfect for adults who want an active Florida lifestyle. The community is loaded with extraordinary amenities including a beautiful 25,000 square foot clubhouse, swimming pools, state-of-the-art fitness center, sports courts, and a full schedule of activities. Located on Lockwood Ridge Road just north of University Parkway, Cascades of Sarasota is a 24 hour secured gated community. Owners enjoy extensive amenities in this maintenance free community. There’s a beautiful spa and exercise facility with saunas and showers as well as a resort-style indoor/outdoor swimming pool. Tennis players enjoy six lighted Har-Tru tennis courts with a Pro Shop. There are even three Bocce courses too. Contact Annette Smith direct at 941-504-3922 to learn more about the Cascades of Sarasota. She will be happy to send you additional information or make arrangements for a tour of properties.